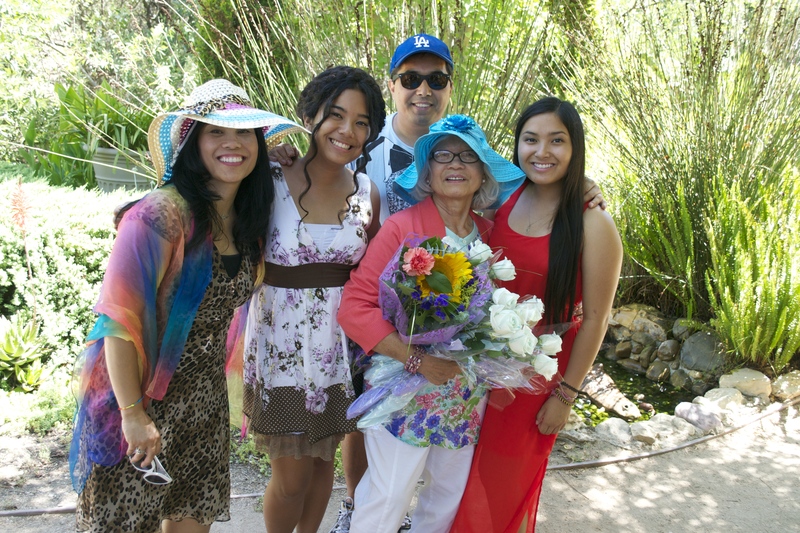 A Beautiful Mom, A Beautiful Garden, and Beautiful Gifts God Gives! | Heart Gifts of H.O.P.E. Feel free to sip your most refreshing summer beverage as I share my thoughts. 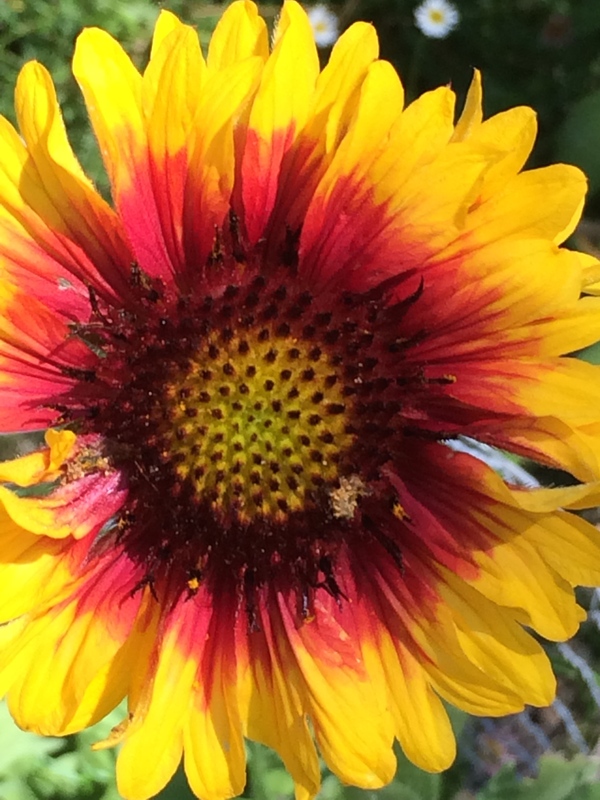 And friend, if at the end of this post you feel a little inspired by hope and/or inspired to live more joyfully in the days ahead, I’d love to know how you’ve been touched through my blog. My calling and destiny in life is to share HOPE with the world as “Bea” — a “blessed bringer of joy”. Happy, Hope-filled, Joyful Summer Days to YOU and your loved ones! 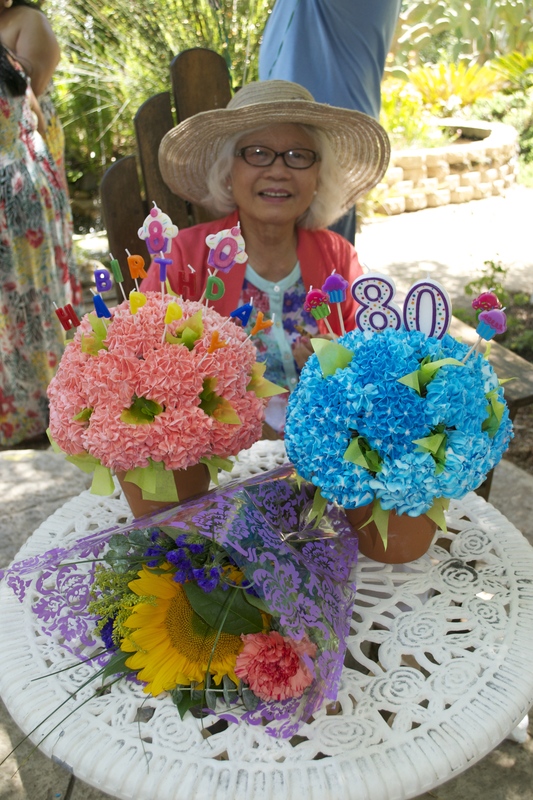 My beautiful, beloved mom just turned 80-years old on Saturday, June 28th, and it was a picture perfect day to celebrate her milestone birthday in a lovely garden-setting! My mom, Leonor, has been blessed with a long life and I’m thankful to God I can still honor her and enjoy her presence here on earth. Her name, Leonor, actually means “light,” and I think you’ll agree with me—she looks absolutely radiant, like a bright light, in the photos taken of her just before she blew out her birthday candles placed on her adorable pink and blue hydrangea-looking cupcake bouquets! 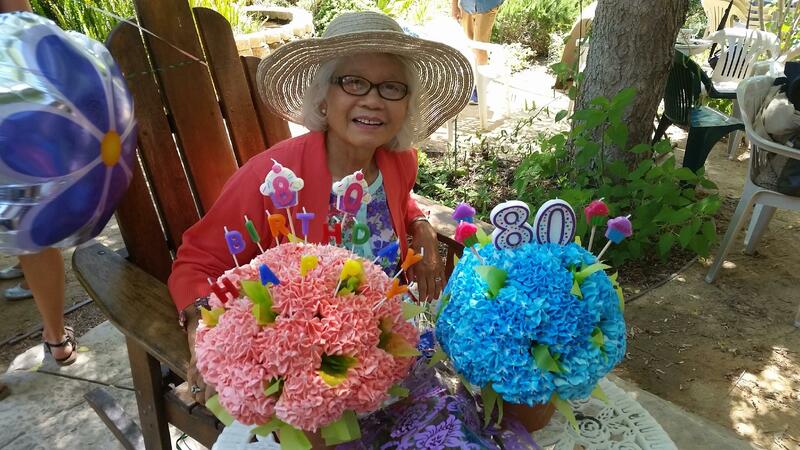 Here she is— my beautiful mom smiling with her cupcake bouquets—YES real cupcakes made to look like hydrangea flowers arranged in terra cotta flower pots. My mom was so delighted to receive these! 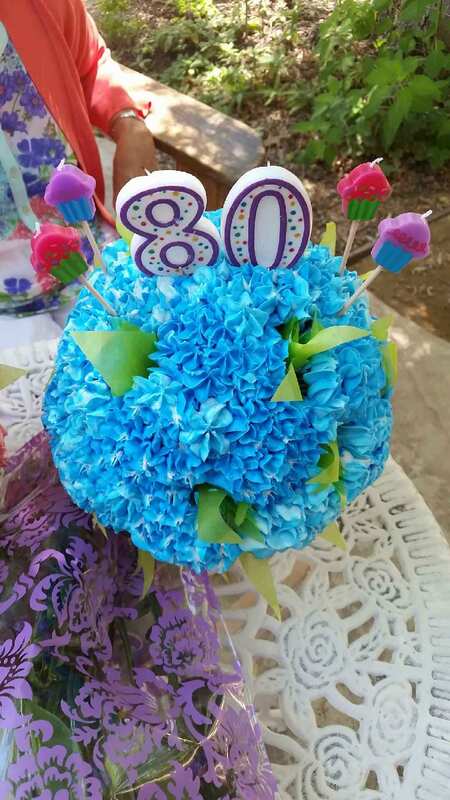 NOTE: I didn’t make these cupcake bouquets for my mom. A gal named Chanda from my church did! 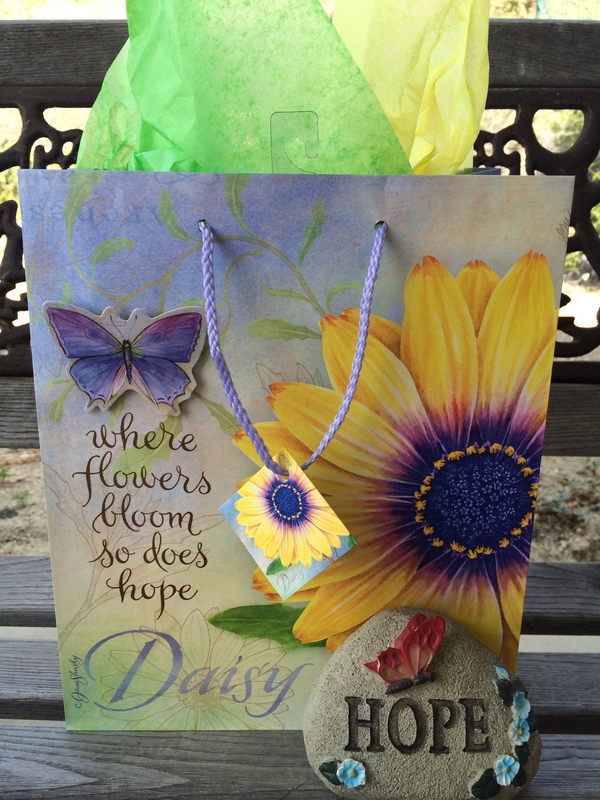 Thanks Chanda for beautiful creations and wonderful inspiration! My husband, Lord-willing, turns 50 in two years. He says that between now and then, there’s plenty of time for me to learn how to make a cupcake bouquet for him:) LOL! Shall I make his a gold-colored bouquet for his 50th? LOL! 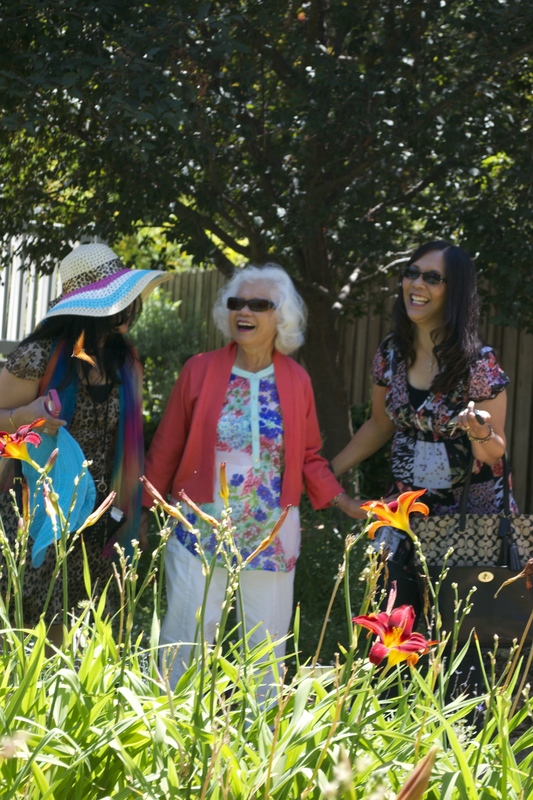 The few months prior to my mom’s birthday I had set out to find the most perfect outdoor garden to have a celebration. My prayer and hope was to bless her with a surprise party and have her be surrounded by family and a few close friends. 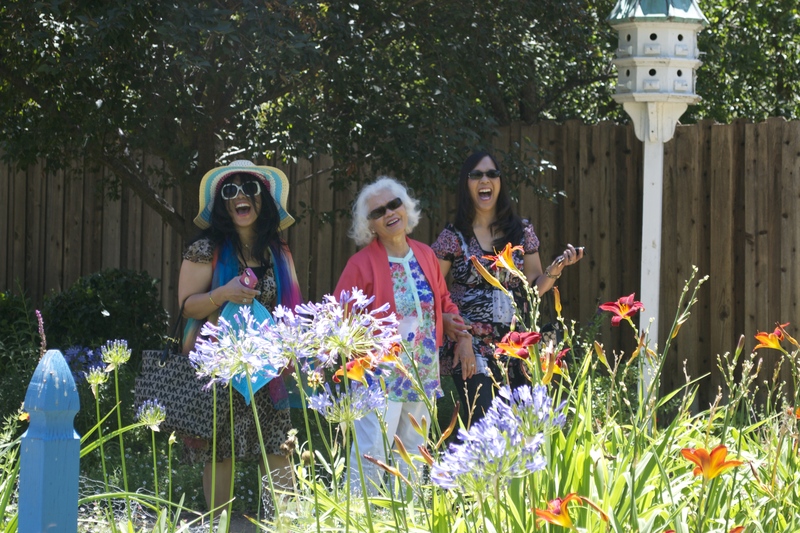 I chose a garden theme because gardening is one of my mom’s passions—she enjoys the beauty of flowers so much I wanted to honor her in a setting that would delight her heart. 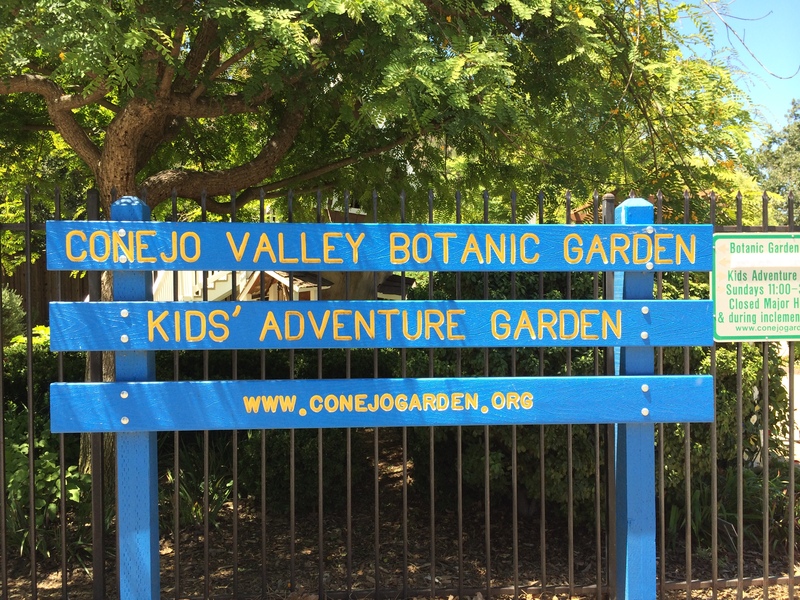 I am so thankful God led me to the most perfect location—back to a very special garden where I had brought my own children to enjoy when they were very young: The Kids Adventure Garden at The Conejo Valley Botanic Garden in Thousand Oaks— right in my own hometown in California. 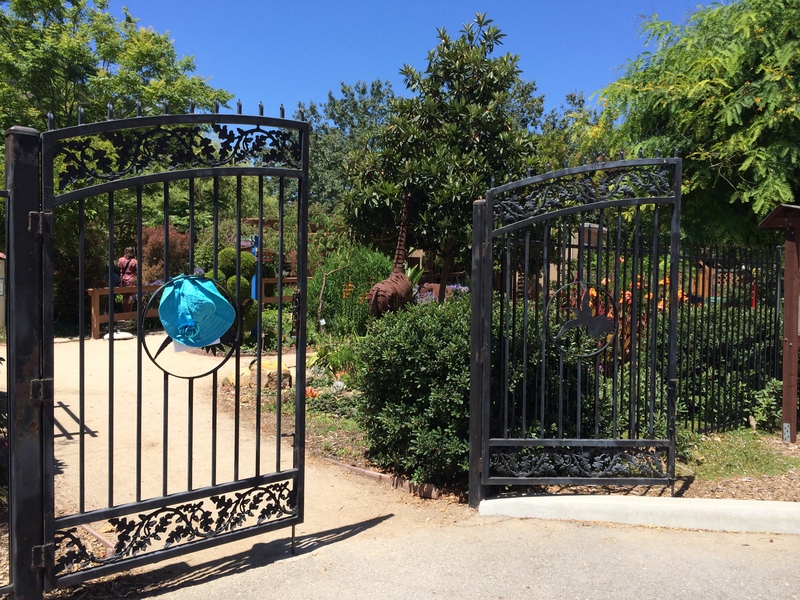 This garden is for kids of ALL ages 0 to 199! My sister Grace and I sure did surprise our mom! See how surprised she looks here in these photos! 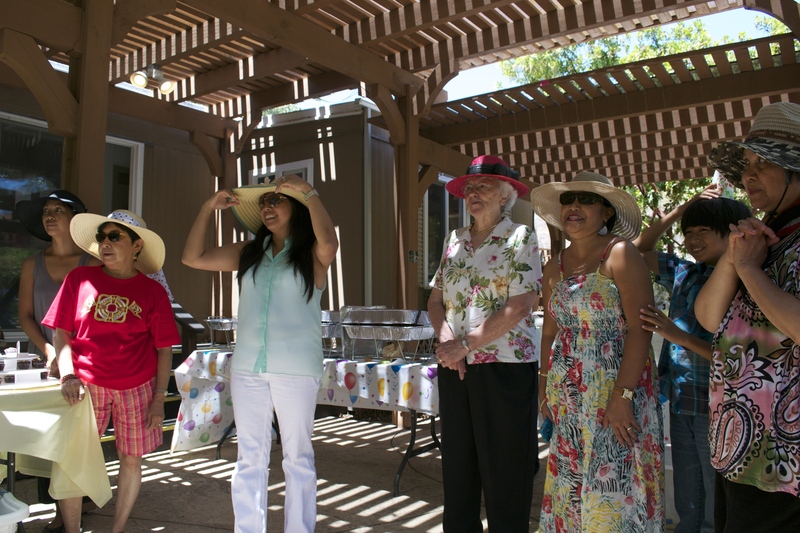 Many of the guests who attended wore lovely hats and participated in “The Hat” contest. Hannah W. “rolled up” her cool summer hat to show everyone how convenient it is to carry her favorite summer hat wherever she goes! (That was one cool hat!) Thanks Hannah! 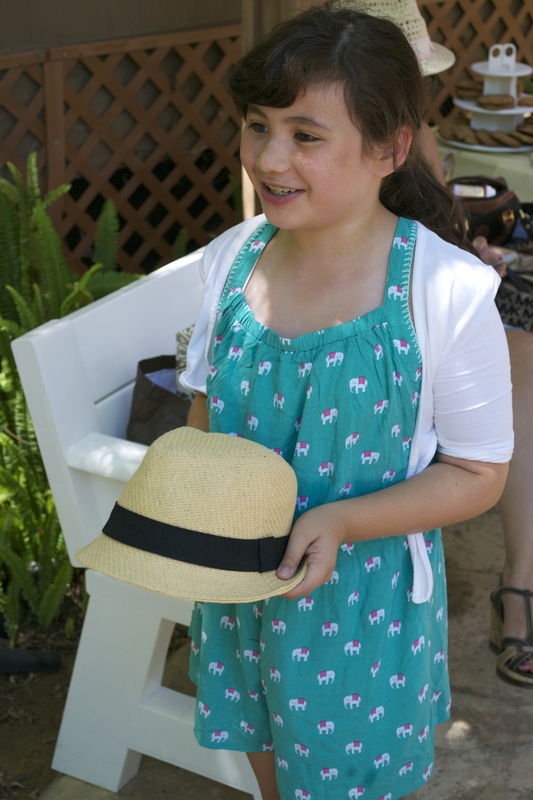 My dear friend’s beautiful daughter presenting her special hat. She said her hat is special because her mom gave it to her:) Awww! 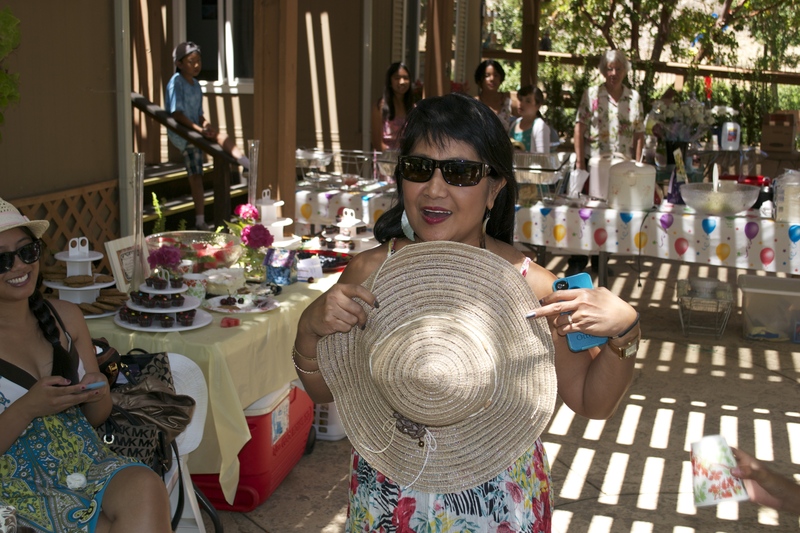 My Sis-in-law presenting her hat to my mom…and she even GAVE her hat to my mom! 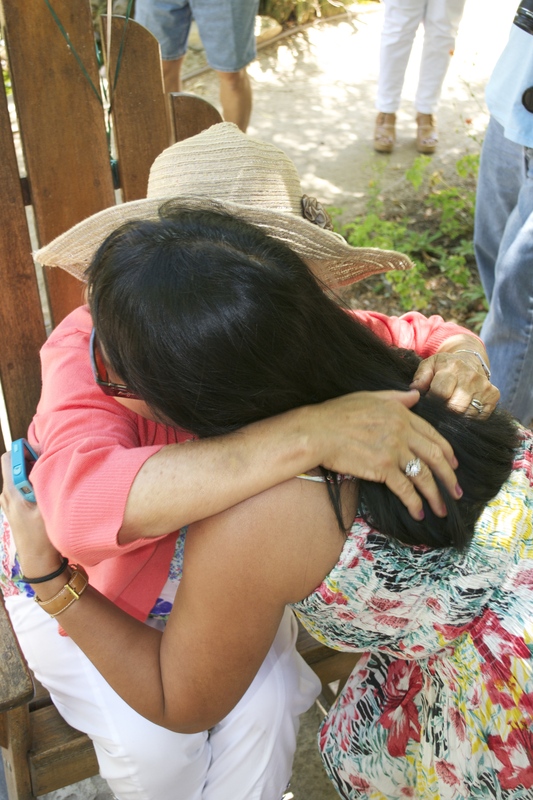 Hugs from my mom to my Sis-in-law for blessing my mom with her hat during the contest. In this case, my mom was so delighted and surprised by Margie! LOL— we all witnessed that a little bribery does work! Guess who won the hat contest? 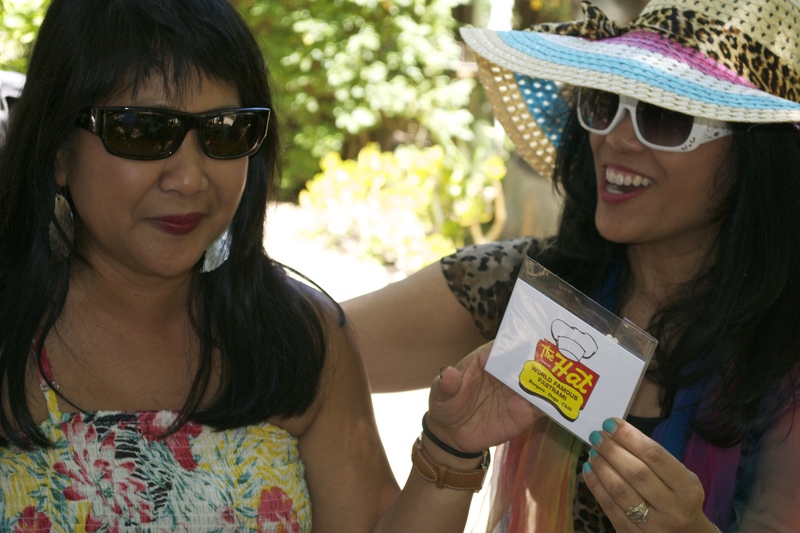 The Winner of The Hat Contest, my sister-in-law, Margie, receiving a Gift Card to “The Hat” restaurant —famous for Chili Cheese Fries and Pastrami Sandwiches! “The Hat” Gift card was intended to be funny as a prize for The Hat contest:) Maybe Margie doesn’t think it’s funny? All of us played a game answering trivia questions about my mom, and each guest was also asked to guess the weight of a giant jackfruit placed in the garden. Unfortunately, the massive jackfruit wasn’t ripe enough to cut open and enjoy the day of our celebration, but I brought the jackfruit in remembrance of my last happy memory made with my dad on March 3, 2013. Back then on that date, we had cut open a giant jackfruit and enjoyed the very sweet fruit together just days before God took my dear dad to his heavenly home. Having the jackfruit present at my mom’s party delighted my heart with that happy memory of being together with my father. My mom appeared to be delighted when she saw the huge jackfruit. 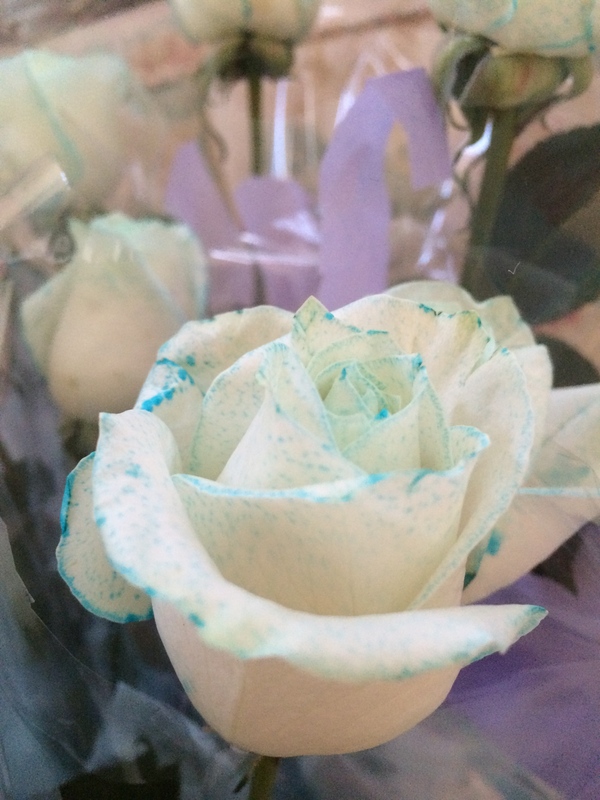 From my heart, it was one symbolic sweet way to honor my mom and remember sweet thoughts of my dad. 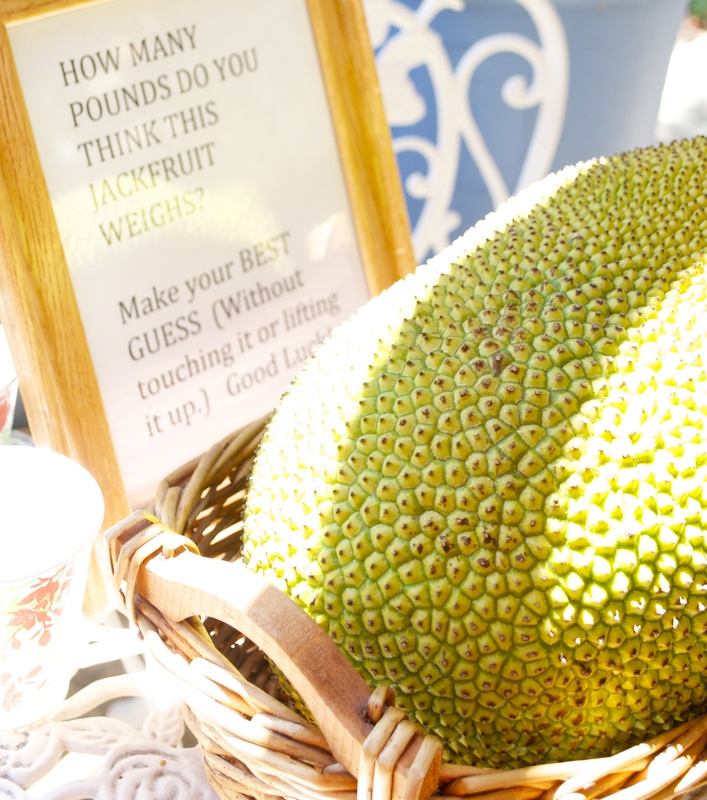 Massive Jackfruit weighing over 18 pounds! Another special highlight of my mom’s surprise party was what I called “Words of Blessings” —a special time where anyone who felt led could share words to bless my mom. I expressed to my mom that in planning her surprise party, I ultimately wanted to honor God by honoring His commandment in Exodus 20:12 “Honor your father and mother, so that you may live long in the land the Lord your God is giving you.” My dad was 4 and a half months shy of turning 80 when his address was changed to the location of his heavenly home. 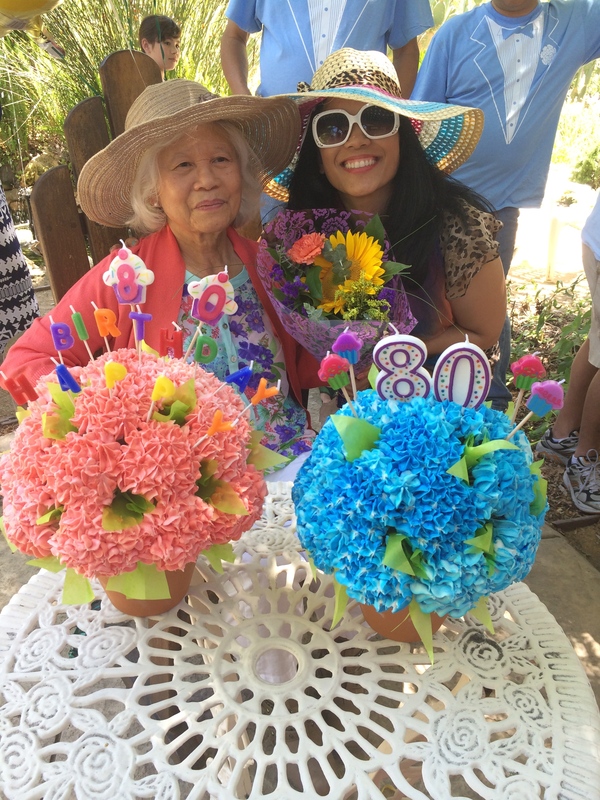 At my mom’s party, I could not help but also make it a day including thoughts of my dad. I revealed to my mom and all the guests that just an hour before heading to The Kids Adventure Garden to set up for her party, I had been shopping at Smart & Final to pick up some fresh strawberries. I shared that someone who I had just met in the store handed me a single giant sunflower surrounded by other flower accents. 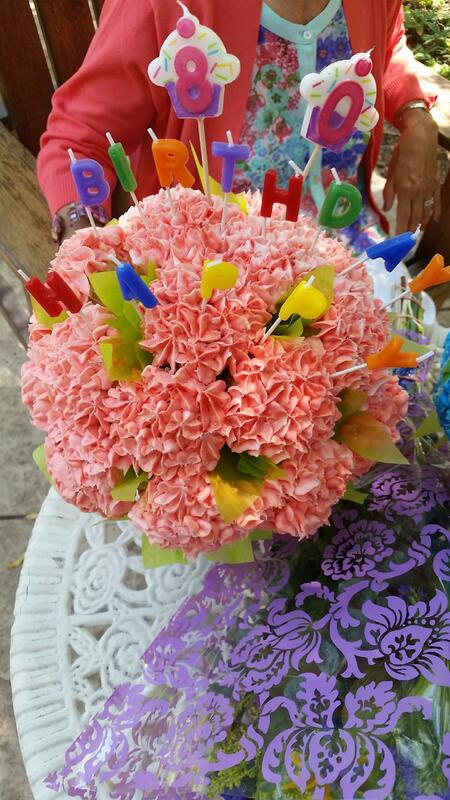 It was a beautiful arrangement of flowers that I never expected— such a surprise blessing to receive such a gift! I’m still so grateful! 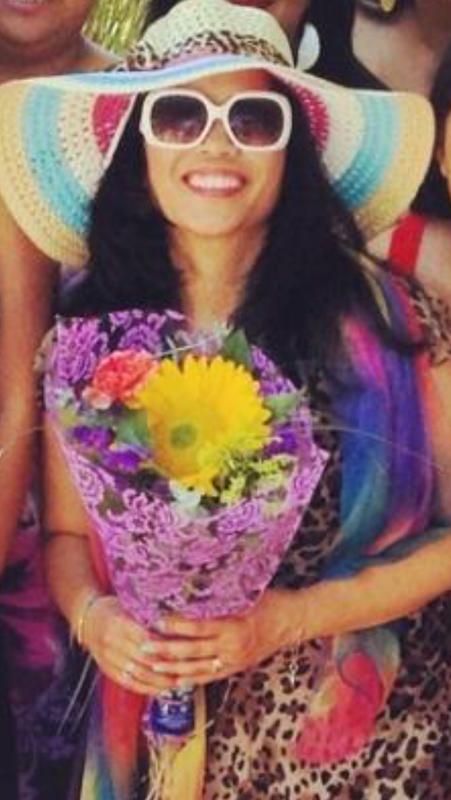 Here I am holding the flowers given to me by a stranger the morning of my mom’s birthday. Bright yellow sunflowers have such a significant meaning to me as they often remind me of a couple of things: 1) my dad’s bright, jovial spirit 2) my dad’s Celebration of Life Memorial in which I used sunflowers as the décor for his celebration, and 3) I am reminded through the gift and beauty of sunflowers to have HOPE—to keep looking to The Son, God’s Son. A fact about sunflowers is that while they are growing, they always face the direction of the sun for maximum growth. I’m reminded that in order to keep growing in my relationship with God, and to stay hopeful, bright and radiant (even when circumstances happening around me might at times seem dismal, hopeless or challenging) I must intentionally keep looking to God’s SON, to trust in Him and His Living Word for daily encouragement. God’s Word is my ultimate source of HOPE. 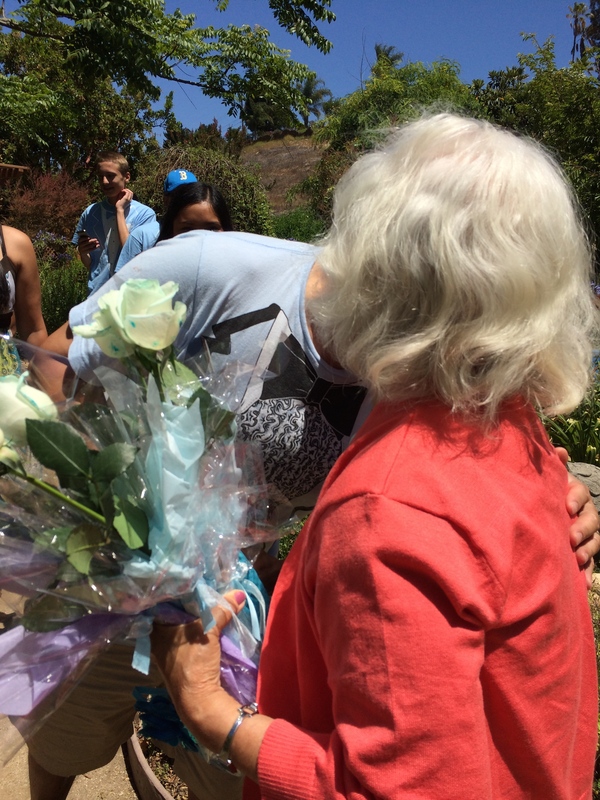 While I was certainly delighted to receive the bouquet with sunflower on the very day planned to honor my mother and my late father— I was more delighted to share the bouquet with my mom, rather than keeping it for myself. Ultimately I felt prompted by God’s Spirit during the “Words of Blessings” sharing time that the bouquet was really meant for me to give to my mom— an encouragement for her to keep looking to The Son (God’s Son) and The promises made in His Word all the rest of the days of her life —so that she might continue to have hope for the future ahead. 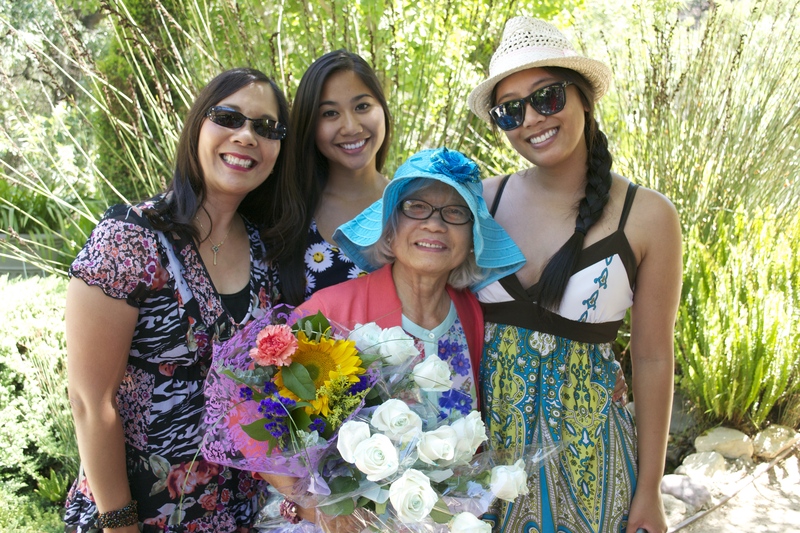 My dear husband, daughters and I with my lovely mom—all smiles on a beautiful day! I’m still wondering what prompted that stranger to give me a bouquet of flowers with the most beautiful sunflower I had ever seen. I won’t know fully until I get to Heaven what prompted her to do this for me on that particular day and with that particular bouquet. This most perfect gift was so meaningful and delightfully personal to me. 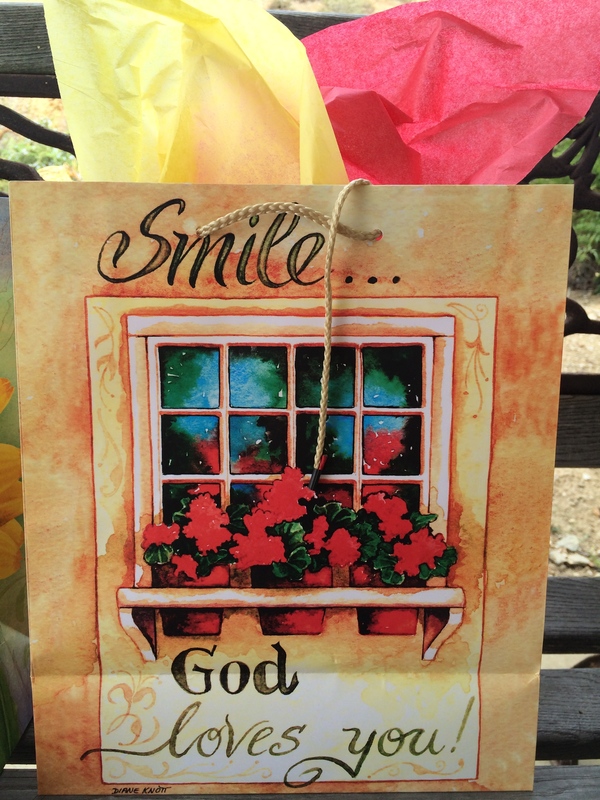 With a joyful smile, I’ll continue to thank God for the many beautiful gifts of encouragement He pours out to me on a daily basis…sometimes even through strangers! 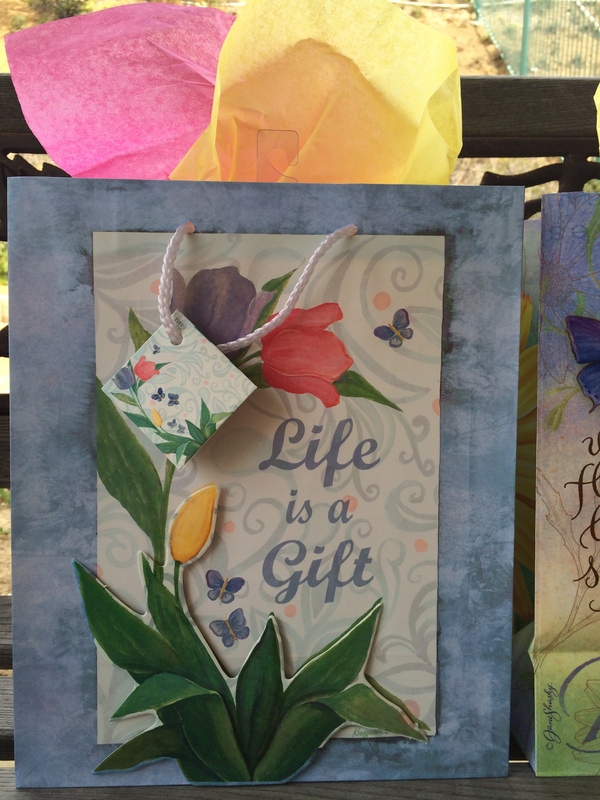 Here are some inspirational and pretty garden-themed gift bags I picked up for my mom’s party. 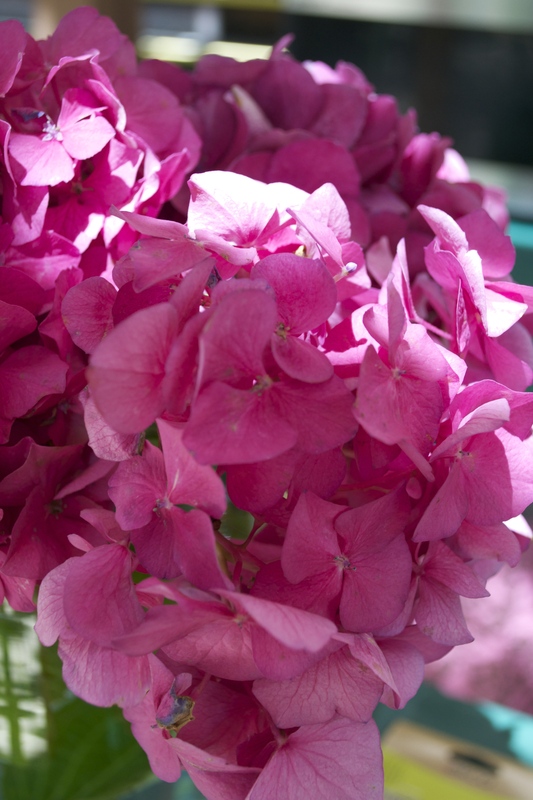 I’m reminded that beautiful flowers do brighten people’s lives. Enjoying flowers God Himself creates can encourage us to always have HOPE! 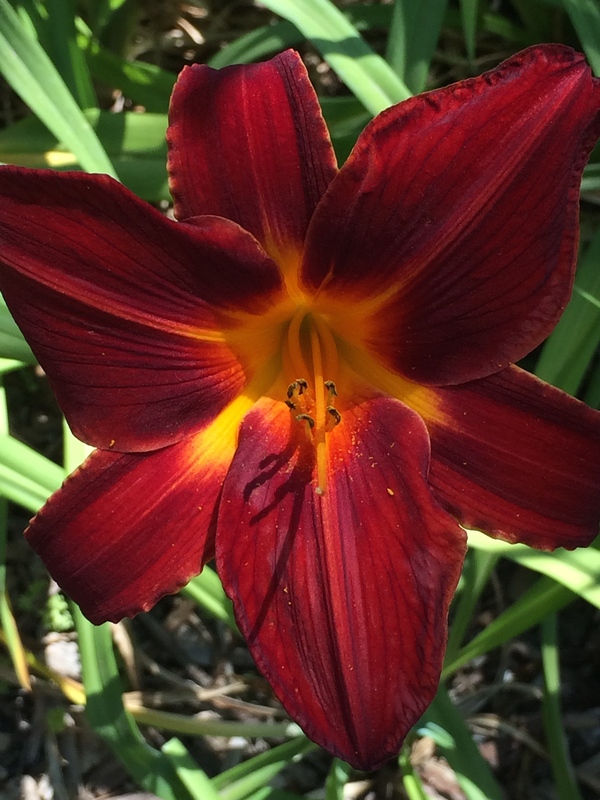 I’ve pondered this as I’ve looked closely at flowers: Since the One true God of the Universe has power to create detailed, beautiful, amazing flowers, I can trust He has power to help me get through life! He cares for every detail of my life and wants me to bloom where I am planted! To all who have started reading, liking and following my blog, may you be richly blessed and encouraged through the very HOPE God has commissioned me to share with the world! Feel free to leave a comment/reply today, and I’d love it if you’d encourage your friends to check out my blog as well. For those who do leave a comment, I’ll be carving out a special time of prayer blessing over you and your family. Let me know how I can pray for you! 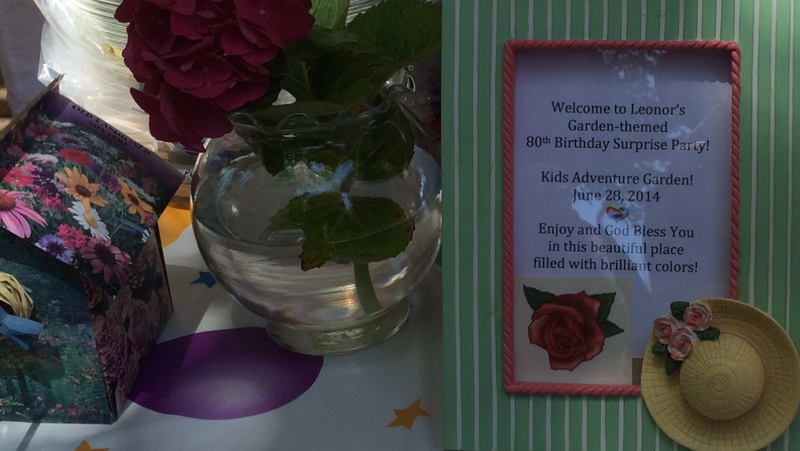 And to my beloved Mom, when you read this post, I hope you will enjoy for many, many more years to come, the happy memory of your 80th birthday surprise at The Kids Adventure Garden. 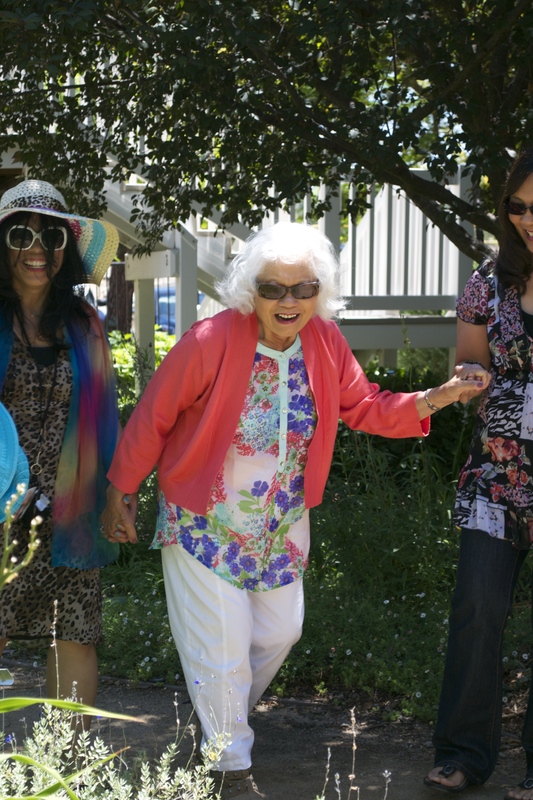 Always stay young at heart! 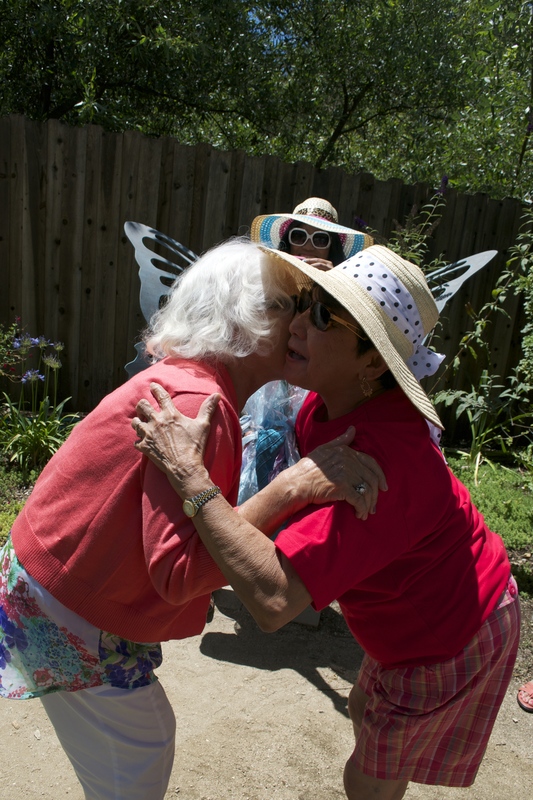 I pray we can create many more wonderful memories and smiles together at The Kids Adventure Garden. I love you mom for you are like the most beautiful rose in the most lovely garden! This was a beautiful day joy! 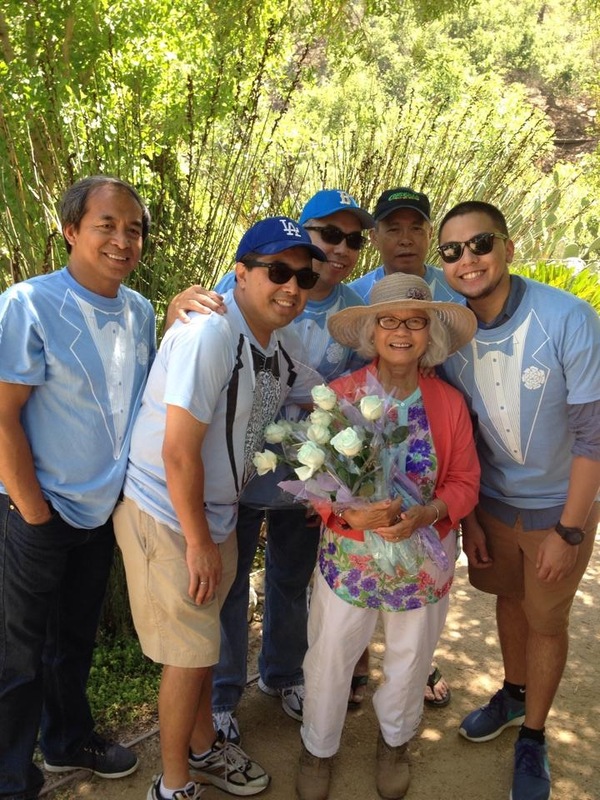 Thank you for including us on your mom’s celebration!! Once again we left being inspired by the love that overflows from your effort to take the time (with many sweet details) to create a special moment with family and friends. Throughout the event I kept saying how everything was so perfect… The lovely garden setting, weather, friendships, delicious food you could smell from the Parking lot, beautiful decorations, planned games and beautiful musical and heartfelt shares from guests….seeing your mom’s smile warmed my heart and we felt blessed to be there!! You continuously inspire me to slow down and take time to celebrate the gifts we receive each day!! Thank you! !